Problem: Balboa High School, part of the public school system in San Francisco, California, needed new low-pressure steam boilers that limited maximum drain discharge temperatures. Solution: Guttmann & Blaevoet Consulting Engineers designed the project, with Tünde Munz, P.E., LEED AP and Principal of G&B, initiating the solution. As required by code, these low-pressure boilers must have relief valves. Due to safety concerns about venting steam near where students are congregating, the designer chose to vent the relief valves into suitably sized piping, which runs to a floor drain inside the boiler room. To comply with plumbing codes limiting maximum drain discharge temperatures, the designer chose to add self-operating, thermostatic, drain-tempering valves that only inject cold water into the vent lines when the relief valves activate. 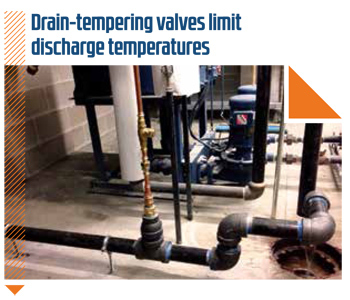 These drain-tempering valves from ThermOmegaTech automatically detect when the drain temperature is above allowable levels and discharge just live casino australia enough water to temper drain flow below the allowable 140 degrees F.
Result: The drain-tempering valves require no outside power or signal, which made the installation efficient, clean, relatively simple and cost-effective.